Colombia has a proud tradition of local and regional referendums about of so-called mega-projects, such as dams and mines. This consultative tradition emerged alongside the Colombian Constitution in the early 90s. However, a recent ruling by the Constitutional Court cast doubts about the appropriateness and legitimacy of local referendum to determine the future of large-scale projects. You can read: “Consultas populares y democracia frente a la paz ambiental” by Cecilia Roa García (CIDER, in Spanish). 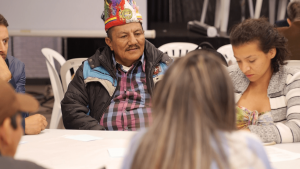 The workshop on popular consultations and environmental democracy took place at Universidad de los Andes on March 15, 2019 in order to discuss this issue. It brought together more than 100 participants (including representatives of social movements and researchers from other universities). The seminar-workshop was organized by Centro Interdisciplinario de Estudios sobre Desarrollo (CIDER) of Universidad de los Andes, in collaboration with the CAPAZ Institute, Heinrich Böll Foundation in Colombia, National Environmental Movement and the Freie Universität Berlin. The first panel discussed the implications of the ruling by the Constitutional Court and other legal mechanisms available to defend earth. Especially now, in the post-conflict phase, new investors show a heightened interest in Colombia. It is more important than ever to evaluate the impact of any proposed mega-project, especially if it implicates extractive activities. Juan Felipe García Arboleda, Rodrigo Negrete and Diana Murcia participated in the first debate. Anchored in Colombia’s vibrant movement of indigenous communities, the concept of “life” is not only attributed towards living beings but also to lakes, rivers and streams. According to Rodrigo Negrete, this concept needs to be understood and considered, even though it falls outside of the spectrum of comprehension for many companies who seek to invest in the business of extractivism. The second panel was moderated by Kristina Dietz (FU Berlin), with the participation of the experts in environmental law, Vanessa Suelt and Diana Rodríguez Franco. The panel discussed in detail the implications of the mentioned court ruling and focussed on the future of environmental activism in Colombia. Despite the ruling of the Constitutional Court, Colombia counts with some of the most progressive environmental laws on the continent, according to the panelists. Despite the seemingly unsurmountable number of environmental problems Colombia faces at present, the tools and potential to achieve powerful and robust environmental standards when deterening the future of mega-projects are given. The rights on their territories of Afro-Colombian and indigenous communities are given by the Constitution and the Constitutional Court. Other groups, such as small-scale fishing communities are particularly vulnerable and need to be considered when evaluating the impact of new investments. The challenge in the coming years and decades will be to choose cases and arguments which provide fertile ground for a holistic and balanced environmental legislative agenda. (In Collaboration with Johannes Butcher). 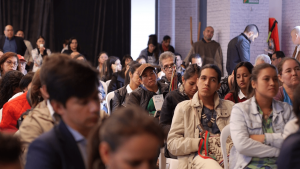 You can watch the video on the topics and conclusions of the Workshop produced by Heinrich Böll Foundation in Bogota (in Spanish).